Security remains one of the principal concerns for modern software systems. In spite of the significant progress over the past few decades, the challenges posed by security are more prevalent than ever before. As the awareness grows of the limitations of traditional, static security models, current research shifts to dynamic and adaptive approaches, where security threats are detected and mitigated at runtime, namely, self-protection. Self-protection has been identified by Kephart and Chess  as one of the essential traits of self-management for autonomic computing systems. From a “reactive” perspective, the system automatically defends against malicious attacks or cascading failures, while from a “proactive” perspective, the system anticipates security problems in the future and takes steps to mitigate them. My systematic survey of this research area  shows that although existing research has made significant progress towards autonomic and adaptive security, gaps and challenges remain. Most prominently, self-protection research to-date has primarily focused on specific line(s) of defense (e.g., network, host, or middleware) within a software system. Such approaches tend to focus on a specific type or category of threats, implement a single strategy or technique, and/or protect a particular component or layer of the system. In contrast, little research has provided a holistic understanding of overall security posture and concerted defense strategies and tactics. In this research project, we are making a case for an architecture-based self-protection (ABSP) approach to address the aforementioned challenges. In ABSP, detection and mitigation of security threats are informed by an architectural representation of the software that is kept in sync with the running system. An architectural focus enables the approach to assess the overall security posture of the system and to achieve defense in depth, as opposed to point solutions that operate at the perimeters. By representing the internal dependencies among the system's constituents, ABSP provides a better platform to address challenging threats such as insider attacks. The architectural representation also allows the system to reason about the impact of a security breach on the system, which would inform the recovery process. To prove the feasibility of the ABSP approach, we have designed and implemented an architecture-based, use case-driven framework, dubbed ARchitectural-level Mining Of Undesired behavioR (ARMOUR), that involves mining software component interactions from system execution history and applying the mined architecture model to autonomously identify and mitigate potential malicious behavior. The first step towards ABSP is the timely and accurate detection of security compromises and software vulnerabilities at runtime, which is a daunting task in its own right. To that end, the ARMOUR framework starts with monitoring component-based interaction events at runtime, and using machine learning methods to capture a set of probabilistic association rules or patterns that serve as a normal system behavior model. 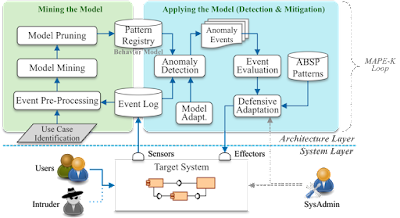 The framework then applies the model with an adaptive detection algorithm to efficiently identify potential malicious events. From the machine learning perspective, we identified and tailored two closely related algorithms, Association Rules Mining and Generalized Sequential Pattern Mining, as the core data mining methods for the ARMOUR framework. My evaluation of both techniques against a real Emergency Deployment System (EDS) has demonstrated very promising results [3,4,5]. 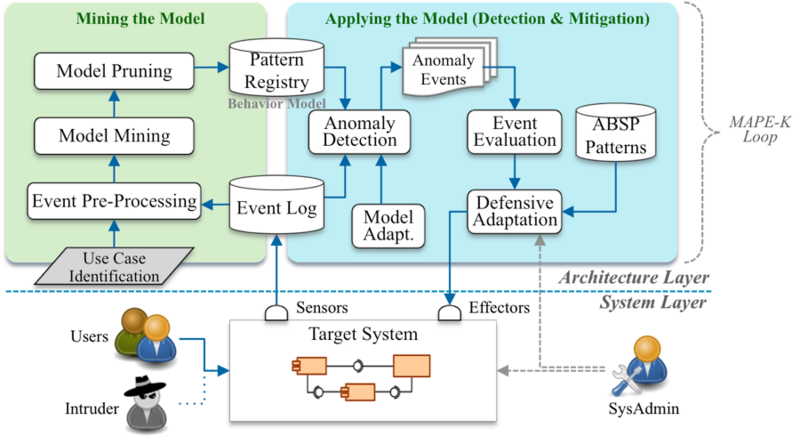 In addition to threat detection, the ARMOUR framework also calls for the autonomic assessment of the impact of potential threats on the target system and mitigation of such threats at runtime. In a recent work [yuan_architecture-based_2013], we have shown how this approach can be achieved through (a) modeling the system using machine-understandable representations, (b) incorporating security objectives as part of the system's architectural properties that can be monitored and reasoned with, and (c) making use of autonomous computing principles and techniques to dynamically adapt the system at runtime in response to security threats, without necessarily modifying any of the individual components. Specifically, we illustrated several architecture-level self-protection patterns that provide reusable detection and mitigation strategies against well-known web application security threats. My work outlined in this project makes a convincing case for the hitherto overlooked role of software architecture in software security, especially software self-protection. The ABSP approach complements existing security mechanisms and provides additional defense-in-depth for software systems against ever-increasing security threats. By implementing self-protection as orthogonal architecture concerns, separate from application logic (as shown in the diagram), this approach also allows self-protection mechanisms to evolve independently, to quickly adapt to emerging threats. Kephart, J., and Chess, D. The vision of autonomic computing. Computer 36, 1 (Jan. 2003), 41–50. Yuan, E., Esfahani, N., and Malek, S. A Systematic Survey of Self-Protecting Software Systems. ACM Trans. Auton. Adapt. Syst. (TAAS) 8, 4 (Jan. 2014), 17:1–17:41. Esfahani, N., Yuan, E., Canavera, K. R., and Malek, S. Inferring software component interaction dependencies for adaptation support. ACM Trans. Auton. Adapt. Syst. (TAAS) 10, 4 (2016), 26. Yuan, E., Esfahani, N., and Malek, S. Automated Mining of Software Component Interactions for Self-adaptation. In Proceedings of the 9th International Symposium on Software Engineering for Adaptive and Self-Managing Systems (New York, NY, USA, 2014), SEAMS 2014, ACM, pp. 27–36. Yuan, E., and Malek, S. Mining software component interactions to detect security threats at the architectural level. In Proceedings of the 13th Working IEEE/IEIP Conference on Software Architecture (Venice, Italy, Apr. 2016), WICSA 2016. Yuan, E., Malek, S., Schmerl, B., Garlan, D., and Gennari, J. Architecture-based Self-protecting Software Systems. In Proceedings of the 9th International ACM Sigsoft Conference on Quality of Software Architectures (New York, NY, USA, 2013), QoSA '13, ACM, pp. 33–42.